Why in the hell would SOE put Serpent Sight on these?? The helm already has Ultravision, and if you don't use that, 95% of rouges will have their mask of deception by 45. Stupid, stupid, stupid. its been changed, forget the mana issue, what i wanna know is how they could be gay enough to put a weak effect like serpant sight on a pair of pants that beongs to a set of armor that the helm already has ultravision... WAY TO GO SONY! 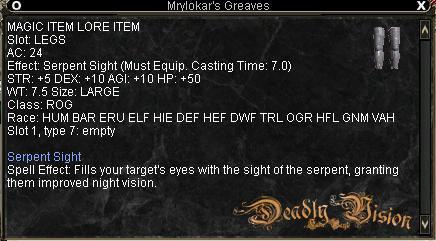 They have taken away the "invigor" and added "Serpent Sight". Loam Encrusted Amice (or any slot item for that matter). These items all have CHA bonuses. Loam encrusted......think about that. Thats saying Dirt Caked clothes are attractive?!?!?!?! #Jimbobjoe, Posted: Sep 28 2002 at 12:19 AM, Rating: Sub-Default, (Expand Post) Ok, you guys have not played as long as me. Putting mana on it was originally a joke! This was an earlier pic of them...! hehe the designers have shown that they don't even play eq many times in the past, such as when the put the 3/10 wep in the game and had it drop off a lv 30, and this is another fine example, some designer doesn't have the slighest idea what a rogue is, but he makes armor for them? I understand this is now hp, but its just kinda funny if you ask me. figured i would join in on the question........WHY DO ROGUES NEED MANA?! feel like part of the crowd now! why do these greaves have mana if they're rogue only? Damn good point, and not the only Rogue Armor with weird points i.e. Ravenscale Boots. +5 Charisma? For boots? Why?? VI should round up all the rogue armors and refit them with rational stats. Once again I am totally disregarding the list price above, so how much do these normally go for? "Dragon slaying is highly overrated"
Ok..This does puzzle me and not to sound like I'm busting on these but, Why Mana? Rogue only +50 mana. I don't get it. Can someone fill me in? Most likely 45 like the rest of the effect armor for specific classes. What in the world do rogues need mana for? Could that be a mistake, and the stat is HP? That's cool and all, but how in the world could the designers miis that in the first place?? Perhaps they need more sleep. Or maybe they need to smoke less pot. What's the cast time on these legs? Supposidly the designer put mana there as a joke, and forgot to correct it. The first or 2nd patch after these were found changed the mana to hp. One of these days I'll get a pair and up a new SS for Allak to post. why do rogues need mana?